I'm not big on resolutions. Especially ones that are dubbed for a New Year. I liken it to obligatory roses on Valentines Day (because nothing says "I love you" more than 12 roses that are double in price because every other man thinks it's romantic to do something for your woman when the entire retail world is telling him to purchase said roses. Don't even get me started...). Typically when the average person looks at me, they gaffaw and say something about how skinny I am. The ones who are even more gusty say stuff about how I probably never eat (not true. I graze like a cow at a hay buffet) or that I will blow away and be Gone with the Wind (also not true. Apparently I hide my weight well, seeing how people audibly gasp when they actually hear my weight number). All this is besides the point, however. I just want to get fit. I want to be ok with wearing a bathing suit, which at the moment I don't because, while the scale may say I am practically at my pre-pregnancy weight, the mirror does not. Things have been shaken up like a top-shelf martini, and I intend to tone and tighten to set things straight. We purchased Jillian Michael's 'Ripped in 30'. I figured 30 minutes a day will not kill me (if you've done this workout, please start laughing at me about now... I realize I may have bitten off more than this couch potato can chew). (edited to add: we started the workout a few nights ago. By 15 minutes into it, I was heaving like I had just sprinted uphill for 2 miles. Bless my own poor little heart. It's going to be a long friggin' month). Spend time with Jesus more regularly. There's one truth as a mom that I cannot deny: the days that I get a bit of Jesus, I am a better mom (and wife). I tend to talk to my kids more quietly, am able to handle some of the chaos of the home a bit better, and just have all around better days when I have at least 5 minutes of a devotion. I recently downloaded You Version on my phone, and it has really helped me remember to grab those extra minutes of quiet time when I can. Have people over for dinner more. I need to admit something: I hate cooking. And having people over for dinner causes me to almost break out in hives. It's not so much that I don't enjoy company, it's just that I have this weird desire for everything to be picked up, for dinner to be hot and delicious to all mouths at the table (who am I kidding-- 2.5 of those mouths (which would be the mouths of my offspring, if you're not tracking) can complain about pizza, which is the food on the bottom of the list of 'foods that deserve complaining'), and for all dishes to clean themselves and not multiply like rabbits, which is almost impossible given the number of members in our family added to any amount of guests we may have. Yes. I admit. Company coming over can be a daunting task for an ambivert like myself. But I want my boys to grow up knowing that sometimes life doesn't have to be perfect to form community, and so I'm vowing to have at least 1-2 dinners a month with company, whether it be a neighbor, a friend or someone new. So basically, I was saying that even though my platform may not be HUGE, it's still a platform. And I just don't want to take it for granted. I also want to remember that the words I speak offline to Drew and to my boys and to my friends have the ability to help or hurt. 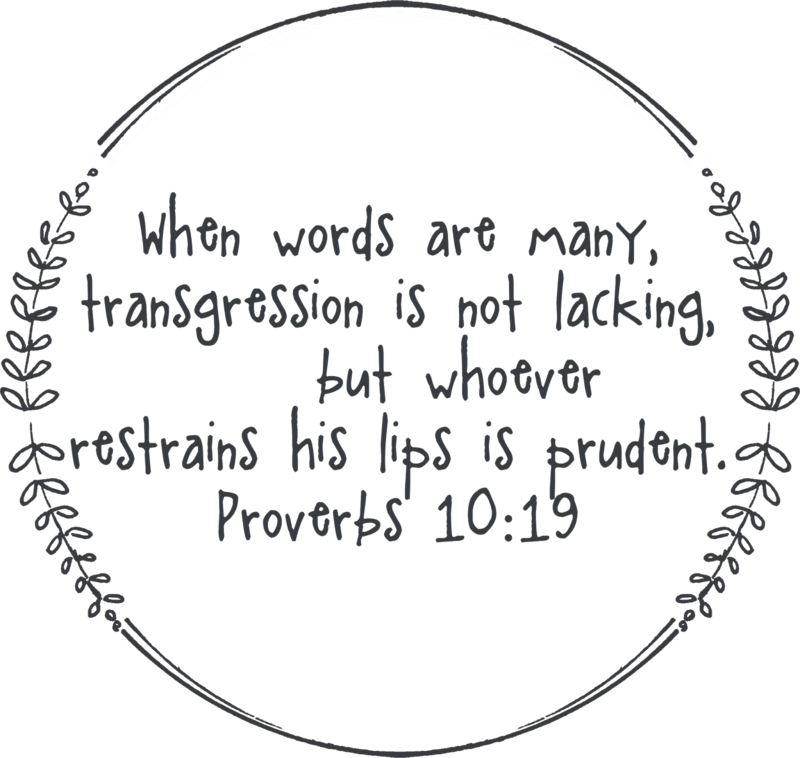 And so, I've claimed Proverbs 10:19 as my verse for the year. Here's to a prudent year with my words. I'll probably mess up (more than once), but I feel like it's a good goal to have, especially considering my attachment to words and social media. Have you set any goals or resolutions this year?